On February 2nd, the 6th Germany scholarship award was celebrated at the beautiful atrium of the TU Berlin. As in the previous year, CrossWorlds researcher Maria Wirzberger participated as sponsor within the program and supported a student from her former Human Factors master’s degree course. During the get-together after the award ceremony, she had the opportunity to hand over the scholarship certificate to her current scholar Nora Moser and engage in lively discussions. 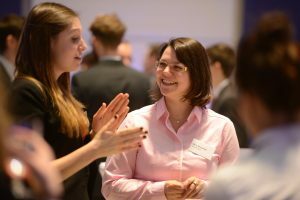 With a steadily growing number of sponsors, various career-related opportunities from involved companies, and an increasing range of social and publicity-related activities amongst the scholars, the Germany scholarship program has indeed proven a success for the university and both sponsors and scholars! This entry was posted on March 2, 2017 at 1:29 pm and is filed under General. You can follow any responses to this entry through the RSS 2.0 feed. Both comments and pings are currently closed.